On 13 October 2016 the former Glen o’Dee Hospital was destroyed by fire. A few days later two 13-year-old boys were charged by the police in connection with the blaze. Glen o’Dee was quite possibly the historic hospital that I most admired. The memory of stumbling across it, without knowing what to expect, has never quite lost its charm. Its future had for long been uncertain and the building lain empty since at least 1998, steadily deteriorating. A new community hospital was built behind it in the 1990s, complicating plans for re-using the original building. Planning permission was granted in 2010 for redevelopment as housing, but nothing was done, and it remained on the register of Buildings at Risk in Scotland. 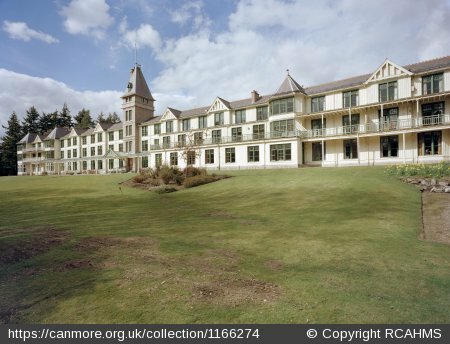 Glen-o-Dee hospital photographed in 1990 by RCAHMS. The contrast with the photograph taken in 2012 is marked. 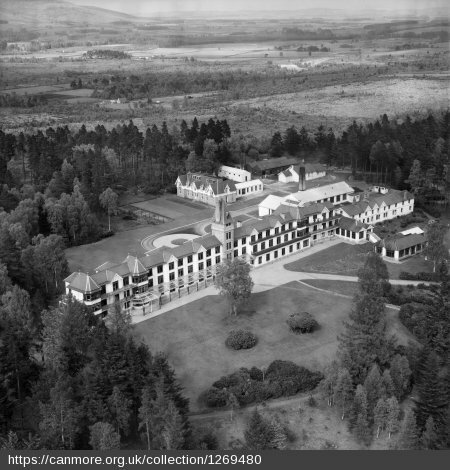 Glen o’Dee was the first Sanatorium to be built in Scotland on the fresh‑air principle. It was designed by George Coutts of Aberdeen and opened in 1900. It was constructed mainly of timber with a central tower of Hill of Fare granite. Balconies and verandas were provided for all the rooms, facing south across the Dee, and access corridors ran along the north side. The recreation pavilion added to the south‑east below the dining‑hall was built in the same style with windows running all around it. Stylistically it was closer to the sanatoria in Germany than any others that were subsequently built in Scotland. But it was also very similar to Mundesley Sanatorium, in Norfolk, which had opened the year before. Glen o’Dee was originally called Nordrach‑on‑Dee, changing to Glen o’Dee when the building became a hotel for a time in 1934. It had been founded as a private sanatorium which treated TB on the Nordrach System pioneered at Nordrach in Baden, established in 1888 by Dr Otto Walther. This treatment mostly consisted of rest in the open air. 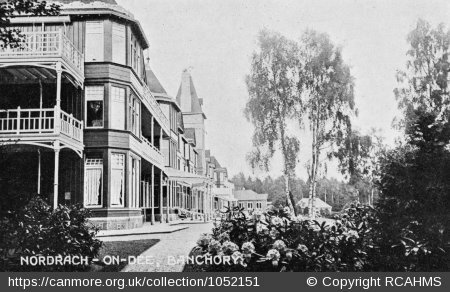 Nordrach‑on‑Dee was founded by Dr David Lawson of Banchory, who had a distinguished career, pioneering work in the treatment of pulmonary tuberculosis. Before the Hospital was built, much discussion took place as to the site. In 1899 Lawson published an article outlining the criteria and giving details of the eminent committee formed to acquire a suitable site. This committee consisted of, amongst others, Professors of Medicine from Aberdeen and Edinburgh Universities. According to their research Deeside’s record for minimum rainfall and maximum sunshine were favourable. The Bremer Sanatorium at Gobersdorf was one of the most influential of the early hospitals pioneering open-air treatment of tuberculosis. From F. R. Walters, Sanatoria for Consumptives, 1899. The site for Nordrach-on-Dee was purchased from Sir Thomas Burnett of Crathes for between £5,000 and £6,000. The building itself was estimated to cost £12,000. Initially there were 40 bedrooms though later additions were made. In 1928 Nordrach‑on‑Dee closed and was unused until its re‑opening as a luxurious hotel in 1934. It was one of the first sanatoria to use x‑rays in the treatment of TB. 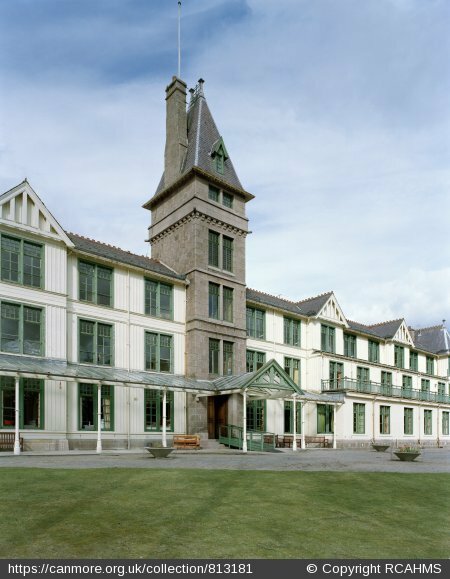 In 1941 the Hotel was requisitioned by the army and at the end of the war it was purchased by the Scottish Red Cross Society, who re‑fitted it as a sanatorium for ex‑service men and women suffering from TB. It was opened as such by the Queen in 1949. In 1955 it was transferred to the National Health Service and was latterly devoted to the care of geriatric patients. Two single‑storey ward blocks were constructed to the rear, the most recent on the site of the former nurses’ home. In 1990 Grampian Health Board had plans to demolish part of the original sanatorium. Whilst its timber construction made it understandable that the building presented difficulties with both maintenance and fire prevention, its undoubted historic importance makes its loss regrettable. 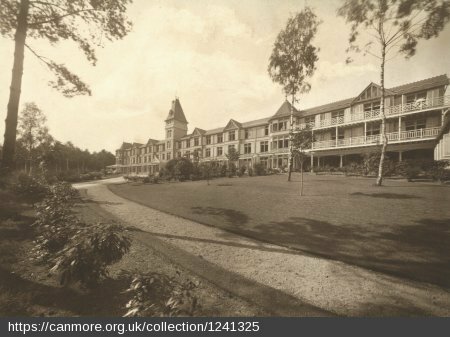 This entry was posted in sanatorium, Scottish Hospitals and tagged Banchory, historic photographs, infectious diseases hospital, sanatorium, Scottish Architecture, temporary buildings. Bookmark the permalink.